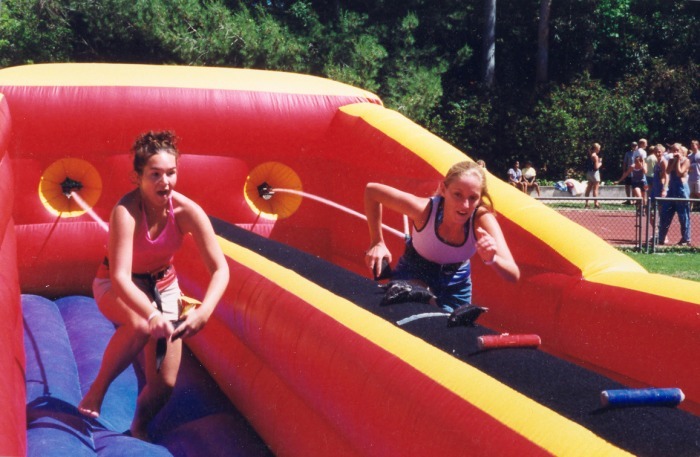 Olympic Field Games - Interact Event Productions - Corporate Event Planning at Wholesale Prices! Participants will compete in different Olympic Style Competitions where they will earn medals (Gold, Silver, Bronze) redeemable for prizes. Gold Coins being worth more points than silver or bronze medals. All participants who compete will receive a medal, only the best of the best will receive the gold! This is a great and challenging way to promote physical fitness as well as good sportsmanship and team building. Gold, Silver & Bronze Medals will be awarded to competitors and will be redeemable for prizes. This X shaped inflatable tests strength, coordination and balance. Strap yourself in and compete against up to 3 other people to see who can score the most baskets. How many points can you score? Tired of the same old boring trips to the beach? Try our Beach Ball Challenge! How long can you stay standing on the ball? 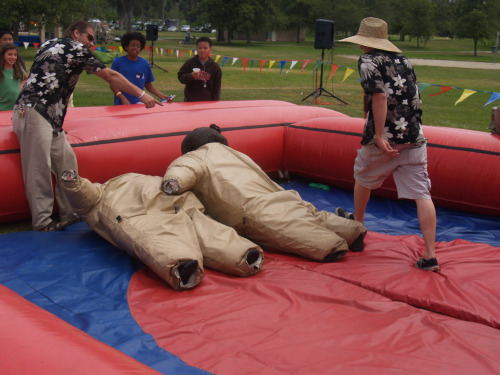 Sumo Wrestling was the first of the larger than life, high-adrenaline games and as such, holds high recognition value. Always sure to pull in a huge crowd, Sumo Wrestling features two combatants dressed in huge, padded Sumo Wrestling outfits, looking just like the Japanese Sumo athletes! This game is always a high-adrenaline, high-profile item which spectators and participants love! Horizontal bungee jumping! Two contestants harnessed to elastic cords sprint down inflatable alleys - until the laws of physics kick in. The person who reached the furthest wins. 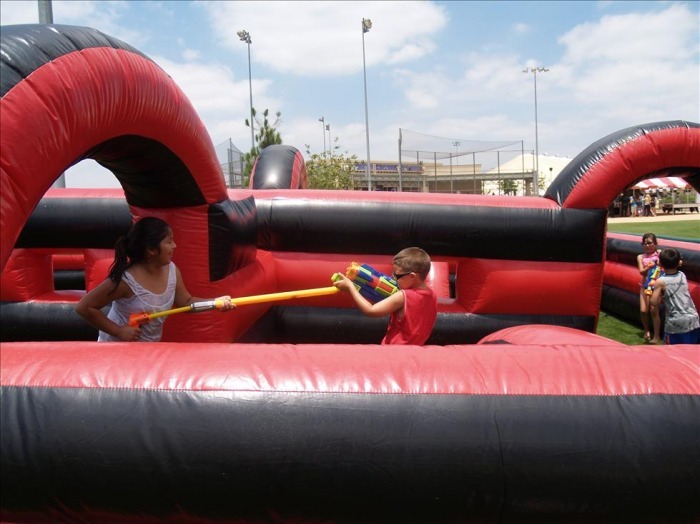 Great for a friendly competition at any Company Picnic, Team Building Event, or Backyard Birthday Party. Includes inflatable, blower, 2 harnesses, bungee cords, markers, and attendant. "Simon Sez" on an inflatable game board. Twist and turn your body according to the attendant's commands. Up to 12 participants can play at once! Great for School Events, Festivals, and Carnivals where you have a large attendance of guests to keep entertained. Includes inflatable, 1 blower, command board, and 1 attendant. Russell Crowe would be proud. 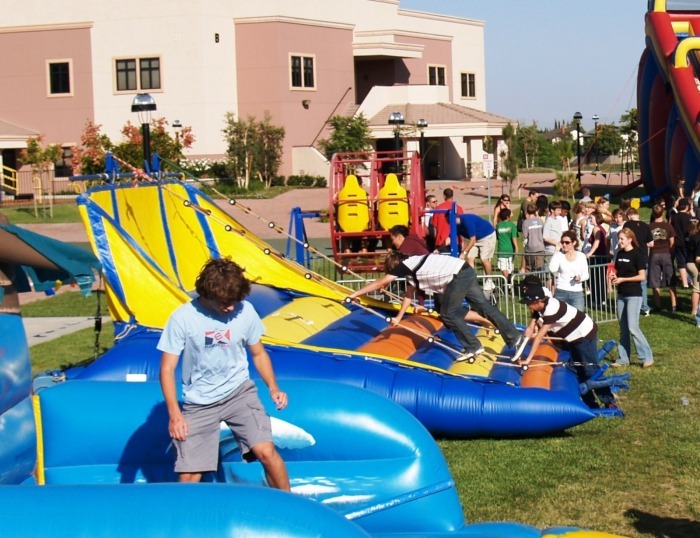 Competitors climb atop platforms and use oversized padded poles to try to knock each other off and onto an inflatable bed. Perfect for Sporting Events, Birthday Parties, and Team Building Events. Comes complete with Inflatable Gladiator Arena! Comes in 4-way or 2-way. 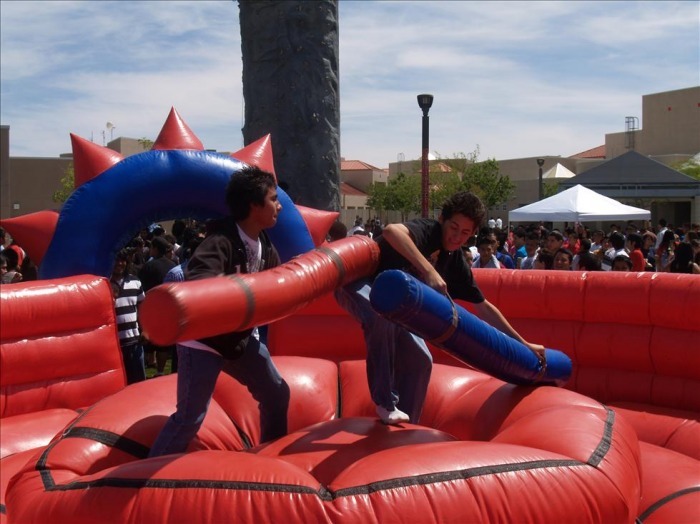 Participants climb on top of their platforms and with their oversized jousting poles they will attempt to knock the other player off theirs. Great for outdoor picnics, sporting events or end of the year school activities. 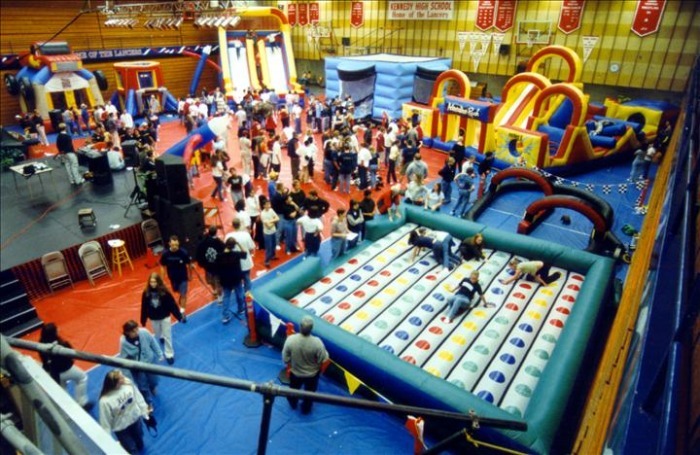 Comes with Inflatable Arena shown here. A life-sized version of the immensely popular arcade table game. Players, tethered to ropes, must work together to score goals. Netting along the sides of the playing field keeps the ball in play for hours of fun. This game keeps a large number of guests involved and playing at one time. It's also a great spectator sport! Perfect for Schools, Team Building, Company Picnics, and Backyard Parties. true test of balance and coordination. Participants struggle to see who can make it to the top, as the ladder twists and turns with their every move. In case they can't hold on, an inflatable mattress will catch their fall. Perfect activity for Team Building, School Carnivals, Company Picnics, and Community Celebrations. Opponents challenge each other on the top of the blob attempting to knock one another out of the center circle, the last one on the top is the "King of the Blob"
Participants will ride these cars around Flinstones-style and try to push their oppenant out of bounds. Fancy yourself a suburban cowboy? 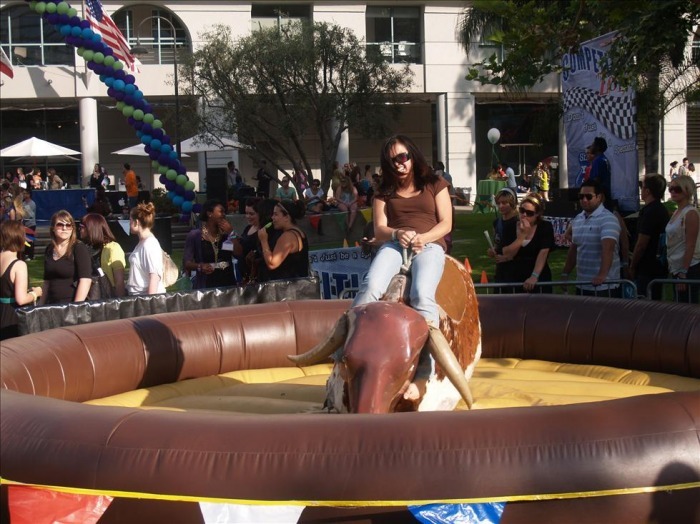 Then see how long you can stay on the bucking bull. This is a great addition to any western theme party. Our operators can manually set different speeds and bucking options - creating fun for all skill levels. 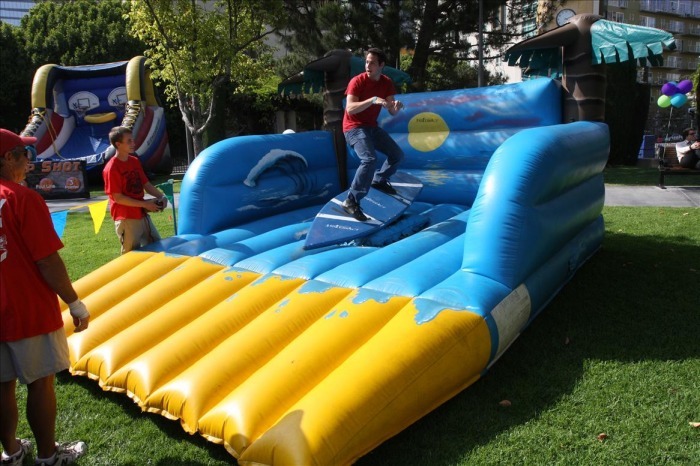 Includes inflatable mattress, 1 blower, mechanical bull, control panel, and 1 attendant. Hang Ten or shred some terrain! The Robo Surfer simulates genuine surfing or snowboarding conditions over an inflated bed (in case of wipe outs or biffs). Great for any Beach Theme or Winter Theme Party! Includes inflatable, 1 blower, mechanical board, speed control panel, and 1attendant. Hard Rock Wall is great for both kids and adults. It is invigorating, challenging, and most importantly, safe because of its auto-belay system. This events is great for Team Building, Company Picnics, School Events, and Community Festivals. This is one of our premier attractions that provide an amazing experience for those that play and watch; Have your chance at 8 different ropes course elements at your venue. This portable ropes course experience is suitable for most ages and in a fun and interactive way, provides self-discovery. Guaranteed experience that no one will ever forget. This piece is great with our climbing wall, our zip line obstacle course and other multi user attractions. Take on the world on this incredible bungee ride! You are attached to the Trampoline Thing by bungee cords and the higher you jump, the higher the bungee cords whip you into the air. Now I know what a yo-yo feels like! You can even do spins 20' up in the air! Hit me with your best shot! Our unique water maze is high enough to hide behind but low enough to allow for spectators to laugh at the super soaking action! Our water tag guns are high action, high speed and super fast loading. This is a perfect summertime outdoor activity soak your friends and your boss!